Is August seriously almost over? As I was typing in the date above, it took everything I had not to type in July. Where oh where has this summer gone? As I mentioned, I'm going to be making some changes to the blog in the coming weeks, and one of those changes is to include a monthly self-portrait. For one, I thought it was high time I stepped out from behind the camera and showed my face on the blog. As I was doing some recent edits, I realized just how few photos there are of me and I thought it was about time to change that. For two, I wanted to do a better job of documenting my own life in photos. It's about time that I start practicing what I preach! For three, I'm really not a big fan of using a tripod. I tend to find it frustrating and I usually avoid it when at all possible - even resorting to hand holding the camera for slow shutter speeds that really would do much better on a tripod. The best way to overcoming something is to do it, right? And it's pretty much impossible to take a self-portrait without a tripod. For four, I wanted the challenge, and the life lesson. I think that taking a self-portrait is much more difficult than taking a portrait of someone else. We are always so much more critical of ourselves than of others, and taking your own photo is a double whammy. Not only can I criticize myself in the photo, but my photography is also up for critique. In recent weeks, I've started on a path toward greater acceptance of who I am. I'm concentrating on trying to realize that I am enough, instead of always zeroing in on my perceived short comings. I'll probably share more on that eventually, but for now... my desire for greater self-acceptance is also fueling my desire to take my own portrait every month. August's self-portrait was taken with me sitting in the chair in the living room of our rental house in Phoenix. I seem to have adopted this as "my place" in the house, and I almost always sit there any time I am in the living room. 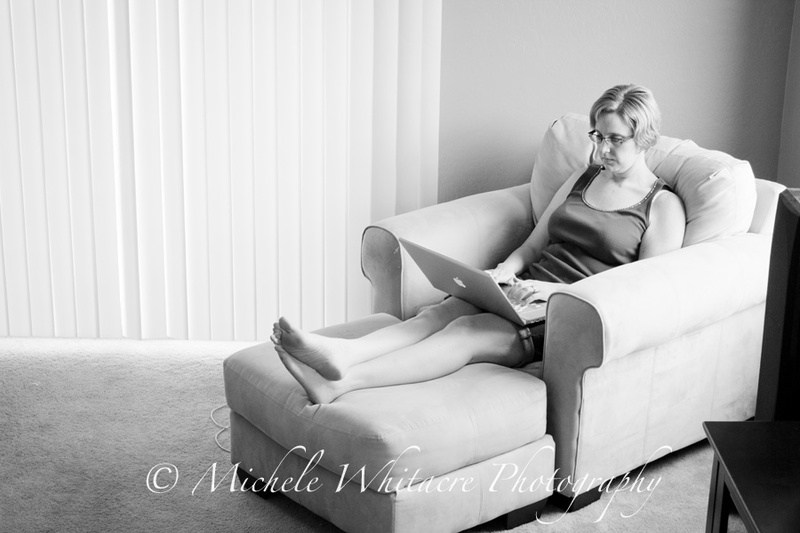 I opted to photograph myself sitting in this chair, with my computer on my lap, because when I look back over the month of August it is nothing but a blur of day after day spent working on my computer as I updated my website and blog. As I was brainstorming for this month's self-portrait, I had an idea of how I was going to take this photograph. On a whim, I decided to reposition the camera and I ended up liking the composition of the image much better than in my original idea. I have a feeling that taking my portrait every month is going to be a wonderful learning experience. Trying to imagine what a shot is going to look like with a person in it is very different from actually seeing it with the person already there!